 As most in the industry know, unclaimed property is constantly evolving. As states continue to propose and enact various versions of the Revised Uniform Unclaimed Property Act (“RUUPA”), they are also expanding compliance efforts via increased audits and introduction of guided self-audits. Most notably, we are seeing a resurgence of Delaware’s efforts to encourage compliance through invitations to participate in the Secretary of State’s Voluntary Disclosure Program, and subsequent audit notifications. Furthermore, states who historically encouraged compliance via reminder letters are increasing efforts through the use of invitations to complete self-audits or participation in their formal voluntary compliance agreements. Finally, we are seeing an increase in the number of audits being initiated by third party auditors and an increase in the number of audits being conducted on the same holder simultaneously. Taken as a whole, the changing landscape creates new challenges for holders, as well as the need for additional commitments of time and resources to address the impact on company accounts. After Delaware’s 2017 restructuring efforts wrapped up, 2018 proved to be a year of renewed efforts to encourage compliance through both the Secretary of State’s Voluntary Disclosure Agreement (“SOS VDA”) program and Department of Finance audits. While new invitations to participate in the SOS VDA program were going out in early summer, the Department of Finance was busy issuing audits on those that received invitations in prior years and elected to not participate in the VDA program. Per guidance provided by Brenda Mayrack, Delaware’s State Escheator, companies that do not elect to participate in the SOS VDA within the 60-day window provided by the SOS’s invitation will be considered audit eligible and will receive an audit notification letter. A second wave of SOS VDA invitations were then issued in the Fall of 2018 and, true to her word, companies that did not elect to participate in the VDA received audit notification letters within 90 days of the invitation. If your company received an invitation to participate in the SOS VDA program and has not yet received an audit notification letter, you still have time to elect participation in the SOS VDA up to the date of an audit notification letter. Please note, it is not a matter of “if” you’re going to receive an audit notification, but rather when. Keane is also seeing additional efforts from the Delaware Department of Finance to confirm the validity of negative (zero dollar) reports being filed on behalf of companies that previously completed the SOS VDA program in past years. While Delaware does not require negative reports to confirm that there is nothing due to be reported to Delaware for a given year, many companies elect to voluntarily submit reports in an effort to demonstrate ongoing compliance and to protect the provisions extended via the SOS VDA program. Effective in 2018, Delaware began implementing its new Compliance Review process. As part of the review, Delaware requests a verified report and copies of the company’s policies and procedures to “ensure that the holder has an appropriate, proactive, and deliberate process in place that results in no report or a zero dollar/negative report.” As such, for those companies that file negative reports with Delaware, we highly encourage a review of your unclaimed property policies and procedures to verify that they are reflective of your current procedures so that they are ready to be provided when requested. In addition to the changes that we are seeing in Delaware, other states are increasing their efforts to encourage compliance via self-audits. For example, Pennsylvania has a self-audit program that requires the completion of a detailed questionnaire geared towards walking holders through the various property types that could hold potential exposures. Interestingly, responses to the self-audit process are directed to Verus. New York has also changed their approach to holder outreach. Effective in 2018, outreach letters from the Office of Unclaimed Funds extend an invitation to apply for the Voluntary Compliance program. To determine if your company is eligible to participate, New York requests that holders complete an online questionnaire. Results of the questionnaire are then used to determine acceptance into the program. The letter does not state what happens if you are not accepted into the program after completing the questionnaire, nor do they include the ramifications for not completing the questionnaire or responding to their invitation. In keeping with the shift to guided self-audits, North Carolina introduced a revised Voluntary Disclosure Program (VDP) which includes a series of questionnaires, phone conferences, and self-assessment modules. Failure to respond to an invitation from the North Carolina Treasurer to participate in the VDP may result in an audit notification letter. Finally, on top of state efforts to induce compliance, we are seeing an increase in the number of audits being initiated by third party audit firms. In today’s environment, it is not unusual for mid-size companies to receive multiple audit notifications at the same time. In the past, this occurrence was limited to large organizations, including financial institutions and large oil and gas companies. The impact of multiple audits on mid-size companies is extremely cumbersome and can create a resource and paperwork nightmare. The number one recommendation for companies that receive an invitation to come into compliance with any State unclaimed property program is to be responsive within the periods defined within the letters. Most States would prefer companies to come into compliance through their self-audit or voluntary compliance programs rather than initiating audits. Keane also encourages companies to take advantage of self-audit and voluntary compliance programs for multiple reasons. Most notably, programs of this nature typically provide relief from interest and penalties. They also allow the companies to proceed at their own pace, versus strict auditor driven timelines. Finally, by responding to State invitations, you have the opportunity to demonstrate your company’s commitment to coming into compliance and could potentially dissuade initiatives sparked by third party auditors to audit you in the future. Get new articles sent to your inbox for free.